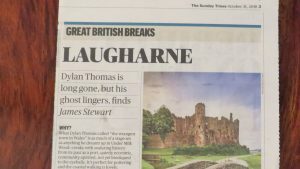 The Boat House b&b was recently recommended by The Sunday Times (travel section) as a great place to stay in Laugharne. 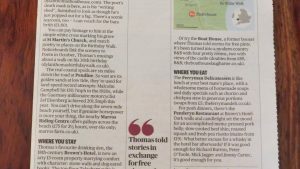 The newspaper sent a journalist to report on the historic township’s attractions, including sites to see, places to eat and of course, the best accommodation. Imagine our surprise and smiles when we found our bed and breakfast prominently featured. Naturally the castle was pictured, and they mentioned that Dylan Thomas used to drink here at The Boat House when the place was a pub (then called The Corporation Arms). The poet would sit in what is now our Scarlet Room, telling stories in exchange for free drinks. Of course we’re delighted to get a favourable mention in the national press and so we’re making a winter special offer to encourage visitors to try us out between now and the end of March 2019. Stay for 2 nights here at The Boat House Laugharne and we’ll give you 50% off a third night. All accommodation is en suite with large, cosy and characterful rooms. We get 97% approval on booking.com and are rated 2nd out of 15 b&b’s/hotels in Laugharne on Trip Advisor. Naturally we’re very proud of this. Our secret is to make The Boat House the way we’d want it to be if we were visiting, with lots of special touches and a very high standard overall. People adore our individually decorated rooms, which are colour themed not corporate, and very spacious. Our breakfast gets rave reviews too, as it includes home made fresh fruit salad, home made yogurt, 7 cooked items and toast made with real bread (not pre-packed cotton wool). The butter is served as curls, never out of plastic portions. Even the jams are top-notch and the serviettes are linen. We make our guests feel really special and many of them return time after time. Come and see why, at a very special rate. This offer is for direct bookings only – call us on 01994 427263. Excludes bank holidays and stays must be consecutive nights.